Honda WR-V - Wow to the EYE. Wow to be IN. Honda has officially launched the WR-V compact SUV in India with a starting price tag of INR 7.75 lakhs for the base petrol version. 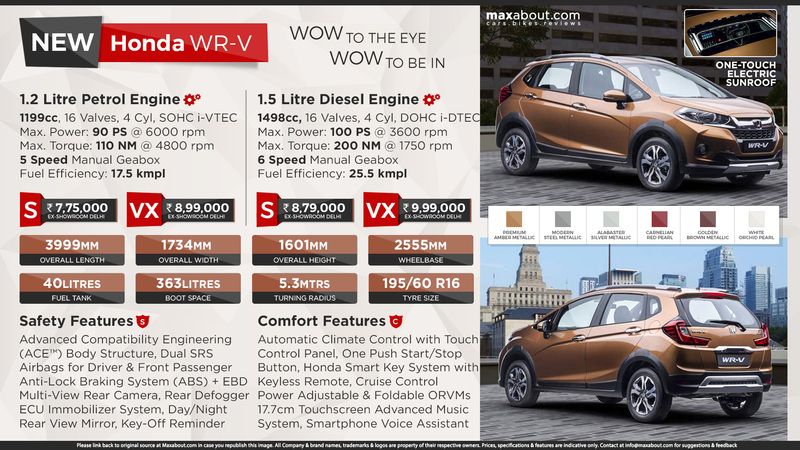 The diesel variant of WR-V starts at INR 8.79 lakhs (ex-showroom Delhi). It is based on premium hatchback Jazz and carries loads of additions to provide it with an exclusive identity. Honda WR-V is available in 2 grades – S and VX. It would be competing with the likes of Ford EcoSport, Hyundai Creta and Maruti Suzuki Vitara Brezza. Read More about Honda WR-V.